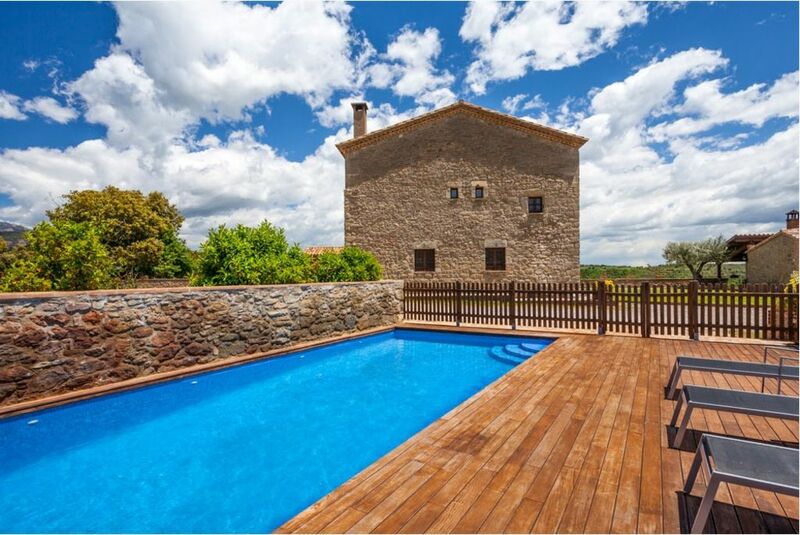 CASA TORRES is a beautifully situated limestone house from 15th century, situated on a hilltop with panoramic views to the Pyrenees. The most impressive detail is the indoor swimming pool which is surrounded by stone walls in lower floor of the house - a unique solution. In 2010, an outdoor swimming pool was added to the many facilities of the house. It is fenced for the protection of young children. CASA TORRES has 450 m2 in total divided on three floors has been renovated with respect for the rustic style and offers a fully equipped kitchen, a beautiful curved living room with fireplace, six double bedrooms and a triple room, all with bathroom ensuite. As mentioned, there is indoor swimming pool, which allows swimming all year round. The kitchen is equipped with two refrigerators, one with freezer, ceramic hotplates, oven, microwave, dishwasher, juice presses, coffee maker, toaster, blender, toaster, and a paella pan for 15-20 persons. CASA TORRES has plenty of facilities, eg. washing machine, table tennis, billiard tables and playground. For families, there are two cots and a high chair available. The house is privately situated and surrounded by a lovely garden with covered terrace and a large lawn. As mentioned, there is a playground for smaller children. Lisbeth and I (Bertel) are the owners of the company SYDENS FERIEHUSE. For the last 14 years we have engaged in letting out fantastic Catalan holiday homes, all of which live up to our criterias: they are authentic, charming homes and are all of a very high standard. We now let out more than 400 beautiful holiday homes, and some of them are advertised on HomeAway - We help Anna and Ramón out CASA TORRES. Catalonia - A proud part of Spain: Discover the Catalan soul in a historical, carefully preserved but modernized country house. In comfortable distance from the crowded beach resorts, but still with the metropolis Barcelona, lively historical towns as Girona, Tarragona and Vic and the natural parks in The Pyrenees within short reach. We offer vacation in your particular pace, where you blend in with the open-minded and friendly Catalans. Enjoy the silence in the small hills in the pre-Pyrenees. Enjoy sports and outdoor activities as walking, canoeing or mountain biking. Or scamper about in the lively street- and café life in the Catalan towns. Here you will discover gastronomic, cultural and artistic impressions that stick. As something new we can also offer apartments i Barcelona and many more are coming. Or how about watching a football match along with 98.917 other spectators on FC Barcelona's legendary Camp Nou? The best advice is to come to Catalonia and see for yourself. Central Catalonia - A autentic holiday: Discover the Catalan soul in a historical, carefully preserved but modernized country house. In comfortable distance from the crowded beach resorts, but still with the metropolis Barcelona, lively historical towns as Girona, Tarragona and Vic and the natural parks in The Pyrenees within short reach. We offer vacation in your particular pace, where you blend in with the open-minded and friendly Catalans. Enjoy the silence in the small hills in the pre-Pyrenees. Enjoy sports and outdoor activities as walking, canoeing or mountain biking. Or scamper about in the lively street- and café life in the Catalan towns. Here you will discover gastronomic, cultural and artistic impressions that stick. As something new we can also offer apartments i Barcelona and many more are coming. Or how about watching a football match along with 98.917 other spectators on FC Barcelona's legendary Camp Nou? The best advice is to come to Catalonia and see for yourself. Activities - Contact us if we can provide info: Finally Catalonia offers a wide range of activities to suit all ages and levels of fitness: Skiing (in winter), swimming, horseback riding, cycling, hiking, golfing, ... there are endless possibilities. We offer a vacation in your particular pace, where you blend in with the open-minded and friendly Catalans. Enjoy the silence in the small hills in the pre-Pyrenees. Enjoy sports and outdoor activities as walking, canoeing, beach life at the Costa Brava Coast or mountain biking. Or scamper about in the lively street- and café life in the Catalan towns. which together with its excellent communications, makes of Catalonia a top-class tourist destination in Europe. Or how about watching a football match along with 98.917 other spectators on FC Barcelona's legendary Camp Nou ? On the Costa Brava coast and in Barcelona you will find plenty of beaches all within 100 km. Very authentic bathrooms and still of high standard. One is adapted for disabled guests. The house has very good facilities, not at least for groups with children. In this area, it is possible to order 'chef in the holiday home' for one or several nights. The house is in long walking distance (3 km.) of the nearest village with bakery, butcher, grocery store and a restaurant / café with outdoor serving. The regional capitol Berga is 12 km. away. The region Berguedá where the house is situated, where the Llobregat river makes its way from the Pyrenees down towards Barcelona. The landscape is hilly and the altitude is 500-600 metres above sea-level. Although very popular as weekend retreat for people from Barcelona, the region has not a lot of tourism. When you are on vacation here, you simply blend in and participate in the local life in the villages and towns in the area. The region is great for outdoor activities, walks, cycling, canoeing and many other things, and the location centrally in Catalonia, gives you the perfect base for a varied vacation, from the nature in the Pyrenees to the cultural experiences in Barcelona and the big towns of the area. The price includes: VAT, use of electricity, heating, water, bed-linen, towels (for each guest is one for the bath and one for the hands - please bring towels for the pool and beach (there is a washing machine in the house) and cleaning at departure. The price does not include: Catalan tourist tax: € 0,5/adult (+16) per night.